Yesterday was a special day for spring migration birding. Poor flying weather had grounded the northbound migrants for the previous two days but Sunday night cleared and the breezes carried a flood of migrants into the southern Piedmont. One of those birds was a black-billed cuckoo that finally settled down at Harrisburg Road Park to refuel by searching for caterpillars. That's where I happened to be too, and if that bird hadn't decided to give its rhythmic coo-coo-coo coo-coo-coo song, I would have never known it was there. There are two cuckoo species that are found in North Carolina. The yellow-billed cuckoo nests here, is pretty common, and is much more vocal. The black-billed cuckoo is more mysterious. It doesn't nest in the Piedmont. A small population nests in the mountains but even there it is a tough bird to find. Though both cuckoos are large birds ( larger than a sharp-shinned hawk), they can be extremely tough to see. They often sit motionless in the tree canopy or thick brush, and when they do move it is with a sluggish demeanor. Sometimes you just have to lucky to see them. 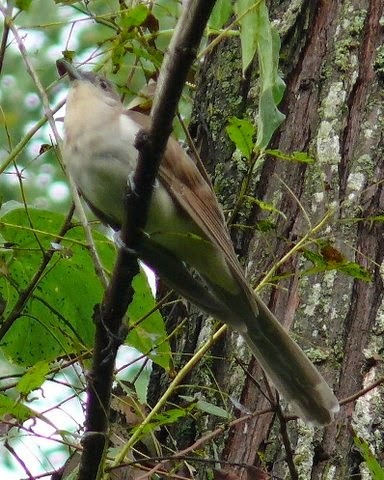 I have seen black-billed cuckoo just once before in Mecklenburg County; some 20 years ago. There is a report or two every year but they typically move on before local birders can see them. This time I was able to alert some locals who did show up in time to see and hear this odd bird. The main physical difference between the two is the bill color. note the black bill on this black-billed cuckoo. But bills can be hard to see, especially on a bird hiding in thick foliage, which this species seems partial to doing. 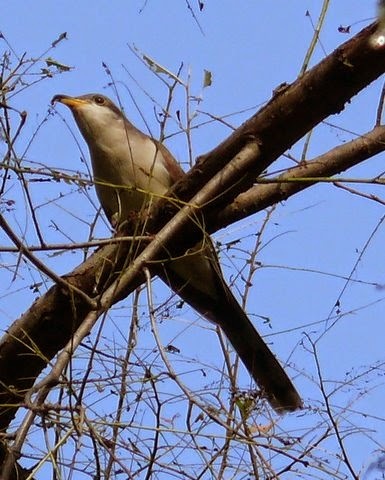 The yellow bill can be readily seen on this yellow-billed cuckoo. This species is a tad less shy than its cousin but can still be hard to see. Even their songs are similar but can be told apart with some experience. I have always been intrigued with how birds are able to construct marvelous creations we call nests. Innumerable types of materials are used by various species; from plain mud to finely woven baskets of grass. I was fortunate enough to see a blue-gray gnatcatcher nest along a portion of the Mallard Creek Greenway last Wednesday. Blue-gray gnatcatchers get started early on nest building, often completing the initial nests well before the leaves come out on the nest tree. Consequently, the nest must be well hidden while remaining in plain sight. Gnatcatchers are tiny birds and of course build a tiny cup of a nest. What is so fascinating to me is that the nest is constructed almost entirely of spider webs and tree lichens. The pair will weave in some fine grasses and animal hairs to give the structure some firmness and stability. If you look closely at the photo you can actually see the spider web strands anchoring the nest to the branch. The lichens are built into the spider web cup to make for perfect camouflage and additional stability. After completion, the nest resembles just another knot on a tree limb. This nest was just about three inches in diameter. 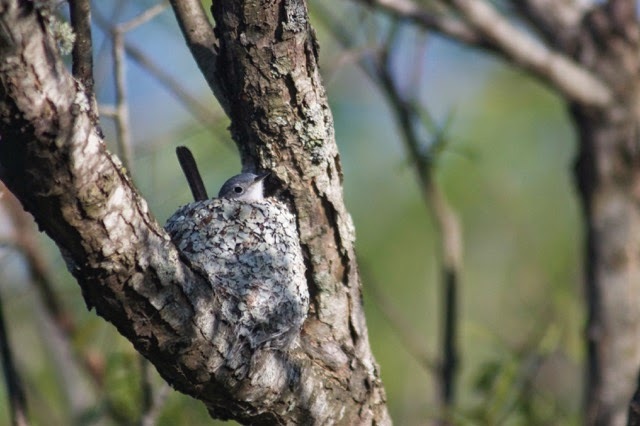 No wonder blue-gray gnatcatchers are so common… few predators can find the nests! Last Sunday I dodged heavy downpours as I made a birding arc around the south shore of Lake Norman from the public fishing access at Cowan’s Ford Dam around to Lake Davidson just north and east of Exit 30 at I-77. Unsettled weather with heavy storms and copious rainfall is a sure recipe for grounding migrants, many of which would otherwise pass right over without ever stopping. Sometimes a local rarity or two can be found among the fallout. I did experience a bit of a fallout at the fishing access. A flock of six common loons obviously had put down due to the weather. They were in fine breeding plumage, much different from their more subdued winter garb. Not far from the shore female lesser and greater scaup gave great side by side comparison views. At Ramsey Creek Park three Bonaparte’s gulls wheeled and dove several hundred yards out. At Lake Davidson a rock outcrop in the middle of the lake hosted four resting Caspian terns, four double-crested cormorants, one great blue heron and 18 ring-billed gulls. The Caspian terns were nice to see; they are regular spring and fall migrants through the area but occur only on the larger reservoirs. It would have been nice for a Forster’s tern to choose those rocks for a rest stop but I missed it if it was in the area. Dozens of tree swallows skimmed the water’s surface in the fading light. In the Davidson Creek channel off Torrence Chapel Road, a loafing flock of 50 ring-billed gulls was joined by a single immature herring gull. Nine Bonaparte’s gulls soon joined them, almost all of them sporting the solid black hoods of breeding adults. I was hoping for much rarer gull with a black hood, a laughing gull, but none ever joined the roosting flock. A pair of osprey voiced their displeasure with me and my spotting scope lingering too long close to their nest. 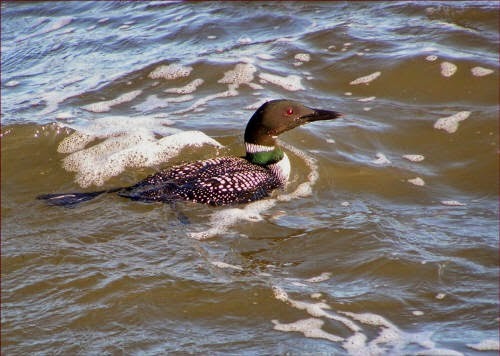 Four more common loons in breeding finery cruised by. As it got darker and the rain began to fall again, I watched a large mixed flock of turkey and black vultures gather and wheel low into their nighttime roosts. It was time for me to go too. Below are some of the birds I saw during that afternoon. Identifying the two scaup species can be challenging.. The differences can be seen in this photo below. the lesser scaup is on the upper left. Note the purplish tint to the head. The head is also more oval-shaped, with a peak at the top. 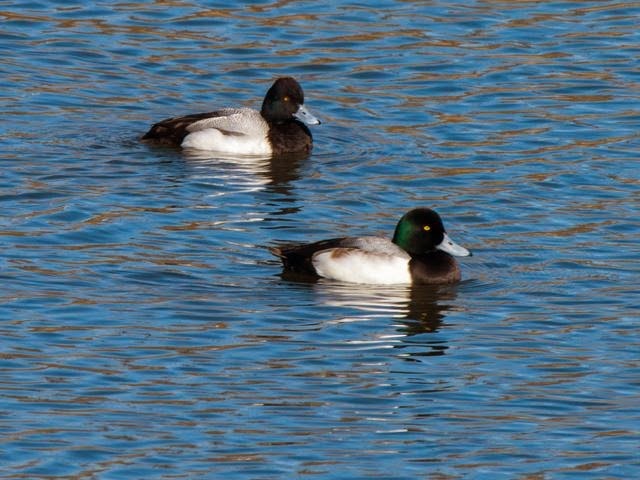 The greater scaup on the lower right has a more evenly rounded head with a greenish tint. Caspian terns are our largest terns in North Carolina, as large or larger than some medium sized gulls. 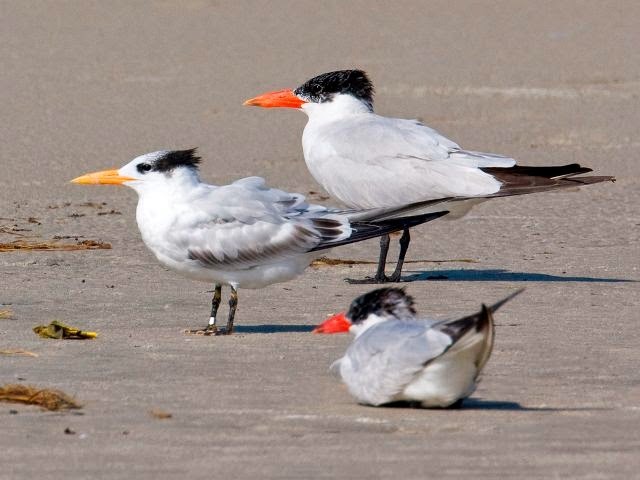 The two birds with the red bills shown below are Caspian terns. The other bird with the orange bill is a royal tern. Caspians pass thru the Piedmont during the migrations, royals are strictly coastal. but by April the adults have transformed their plumage into the black / white speckled upperparts with striking black head and neck bands. 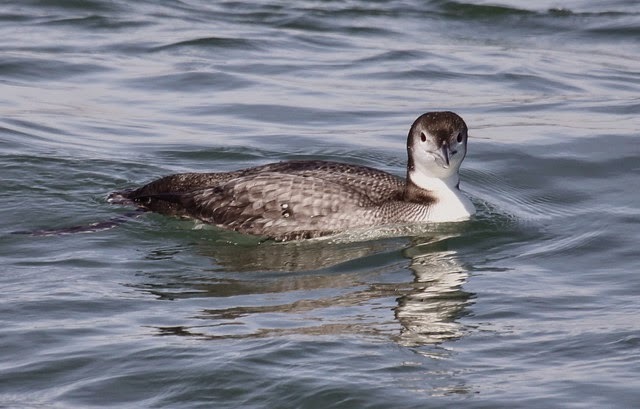 Common loon by Jeff Lewis. These Area Birds are Bluer Than Bluebirds. Eastern bluebirds are familiar birds to even the most casual of observers. They live in our backyards, patronize our feeders, and readily accept nest boxes. The males can be breathtakingly beautiful with their bright blue upperparts. 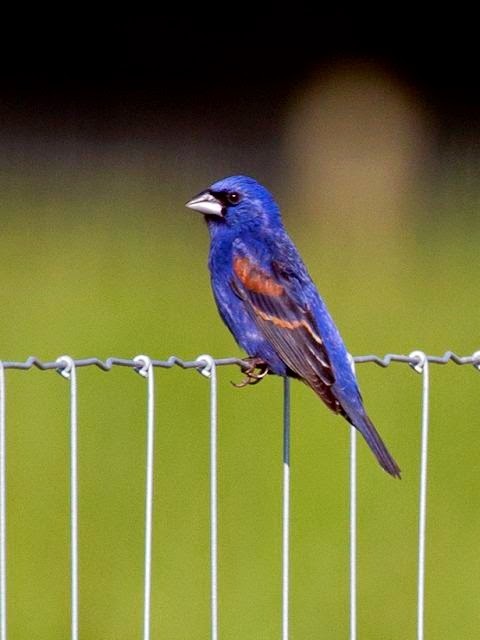 Indigo buntings (above and below) are really quite common breeders in our area. They can be abundant in areas of good habitat. Look for them along the greenways, and other areas where there is a lot of edge habitat. The males are brilliant blue as shown here. the females are drab brown, giving the impression of a sparrow. This species will visit feeders when presented the opportunity. Blue grosbeaks (below) are larger than the indigo buntings and have a larger, more massive bill. The brilliant males are a more purple-blue than the indigo bunting, and have a large brown wingbar, easily seen in this photo. 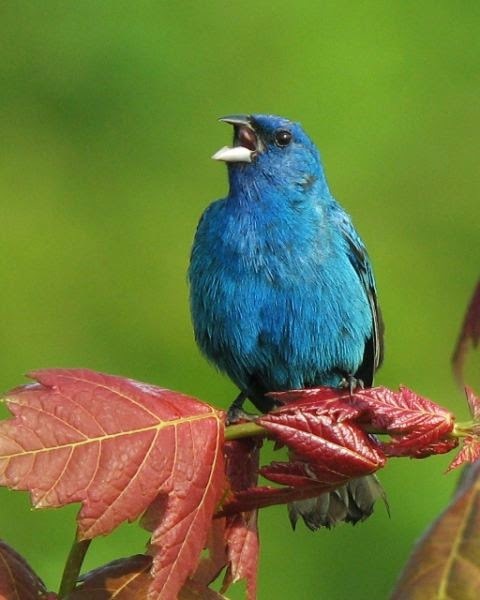 They frequent the same habitats as the indigo bunting, but are generally less common. Like the bunting, the females are brown in color. It has been over a year since I was able to add a bird species to my Mecklenburg County List, so when I got word that a common gallinule was being seen at a pond just off the Catawba River I figured adding that bird to the list was a slam dunk. The reports I got indicated the bird looked relaxed and happy to be there. No good reason to leave you would think. 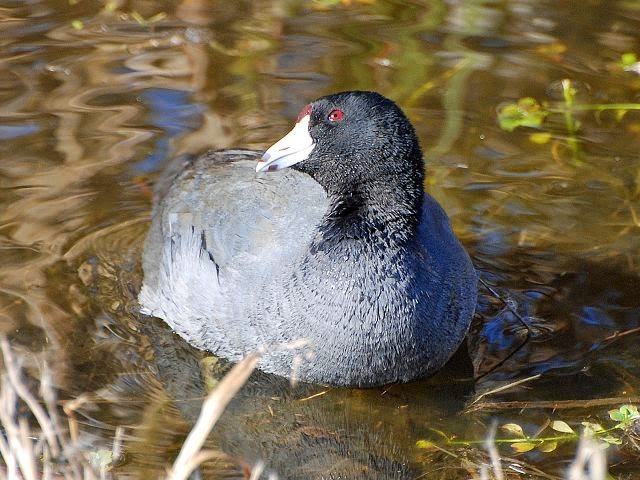 Common gallinules are very similar to American coots. The adults have bright red bills and a horizontal white stripe along their sides whereas coots have the white bill and no stripe. They are birds of swampy lakes with lots of shallow and floating vegetation. They can be common sights at the coast but inland they are pretty rare. There are only a handful of records from Mecklenburg County. I could not run right out to the site when I got the report but I was out there early the next morning. Confidence quickly diminished after I scanned the 80 or more coots along the shores with no sight of one with a red bill. Three passes around the pond yielded no gallinule. This is the problem when chasing rare birds: they have the ability and the will to fly away, and they aren’t afraid to exercise it. So I didn't see the target bird. But there was plenty more to see while I was there. Brightly plumaged wood ducks and blue-winged teal, lingering ring-necked duck, lesser scaup, and ruddy duck, pied-billed grebes, several singing palm warblers of the eastern yellow race, a pair of nesting osprey carrying large sticks to the platform nest site, belted kingfisher, white crowned sparrows, singing savannah sparrows, and a singing white-eyed vireo. Later I stopped off at the Highway 27 bridge over the river to check on the huge cliff swallow colony underneath. That colony is continuing to grow it seems. I shouldn't complain I guess. Overall I have a pretty good success rate in chasing rarities. But the hooded oriole a couple of months ago was a disappointing miss, and now the gallinule miss does have me off to a slow 2015. It’s all about percentages though. I’m sure the next chase will be fruitful. 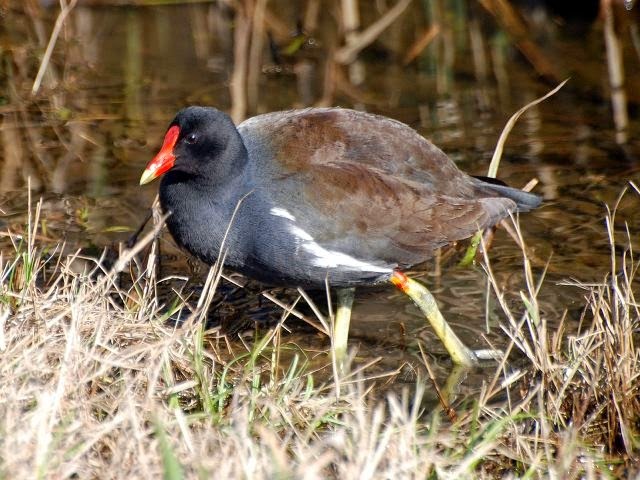 Common gallinules have a bright red bill and frontal shied, and a white stripe on their sides. The similarly built American oot has the white bill and is a colder gray color. Thanks to everyone who reported their first hummingbird sightings of the season. I received over 60 reports from readers reporting observations from as early as March 25. A few seemed to indicate rufous hummingbirds that were probably moving out as the ruby-throateds were moving in. By about March 31 the ruby-throated reports were exclusively pouring in. Keep in mind that these initial reports are likely a combination northbound birds and local breeders. There will probably be a decline in activity at feeders as the northern birds move out, reducing the temporary glut of hummingbirds in the area. Keep the feeders up though, you may be lucky and host a breeding pair. If your birds seem to disappear, don’t worry. The feeding frenzy will return by late July as birds begin drifting south. Ruby-throated hummingbirds, and other species, are arriving several days to almost a week earlier than they were a couple of decades ago. On March 22 I recorded my earliest Louisiana waterthrush by a full week. Yellow-throated vireos and prothonotary warblers used to show up well after April first. Now they are here by the end of March. Northern parulas appear in the southern portions of Mecklenburg County by the third week of March now, whereas April first used to be the arrival date. Also keep in mind the birds that patronized your feeders through the winter have already moved on; my feeders went almost silent this week when the pine siskins finally departed. Continue to keep the feeders stocked however, especially with fresh sunflower seed. In just a couple of weeks some really exciting feeder birds will be passing through. Rose-breasted grosbeaks visit feeding stations for sunflower beginning in mid-April with a peak around May 1. The males are truly breathtaking. Indigo buntings and blue grosbeaks will take sunflower seeds too. Remember to provide fresh water through the spring too. The brightly colored tanagers and warblers that spend most of their time in the treetops have to descend several times a day to obtain water. 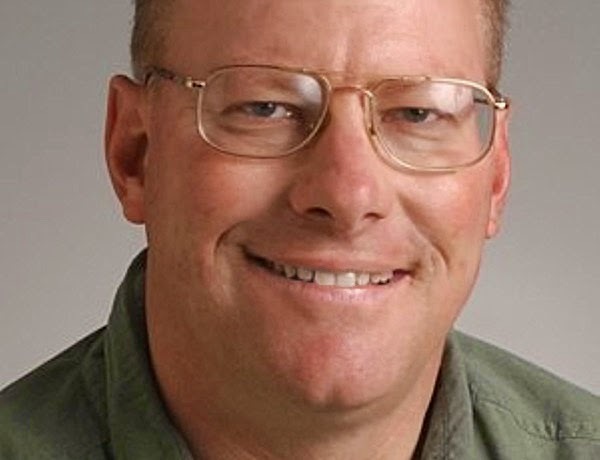 From now through mid-May will be an especially exciting time for birders. Spring migration is accelerating giving folks a brief opportunity to observe northern breeders passing through the piedmont. Last weekend I noticed a Carolina chickadee gathering nesting material and then heading towards my bluebird box. A bit later I checked the interior of the box expecting to see the tell-tale signs of a chickadee nest; a thick mossy base with a cup lined with animal hair. Instead I found the box stuffed with pine needles, the sure sign that an Eastern bluebird had gotten there first. A few days later I checked the box after dark and saw a chickadee sitting atop the pine needles. So I’m assuming the Carolina chickadees won out over the Eastern bluebirds. This illustrates that despite the proliferation of folks who now feed and attract birds to their yards, there is still a shortage of suitable nesting sites for cavity-nesting birds in urban areas. There are primary cavity nesters, those species like the woodpeckers that make their own cavities; and the secondary cavity nesters that move in after the woodpeckers have moved on. These secondary nesters can’t excavate their own home so they are dependent on the woodpeckers and folks who erect bird boxes for their nesting sites. If every tree that dies or develops hollow cavities was allowed to stay standing there would be more natural sites. Understandably, in urban areas the dead trees are often quickly removed. In an residential neighborhood there are about ten native species that might use a nest box if provided. Carolina chickadees, tufted titmouse, brown-headed nuthatch, house wren, Carolina wren, great-crested flycatcher, Eastern bluebird, barred owl, and Eastern screech-owl all could potentially use an appropriate box. In more rural settings, American kestrels, barn owls, tree swallows, wood ducks, and purple martins could use appropriate housing if provided. 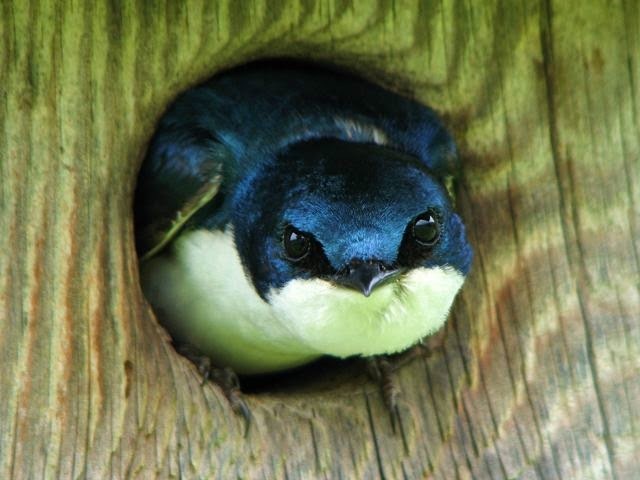 I encourage you to provide a nest box in your yard to help alleviate the cavity shortage. It is not too late to put one up even though nesting has started for some species. Many of them have multiple nestings in a year. Make sure to pick a species that you want to attract so you can provide the entrance hole specifications for that species. 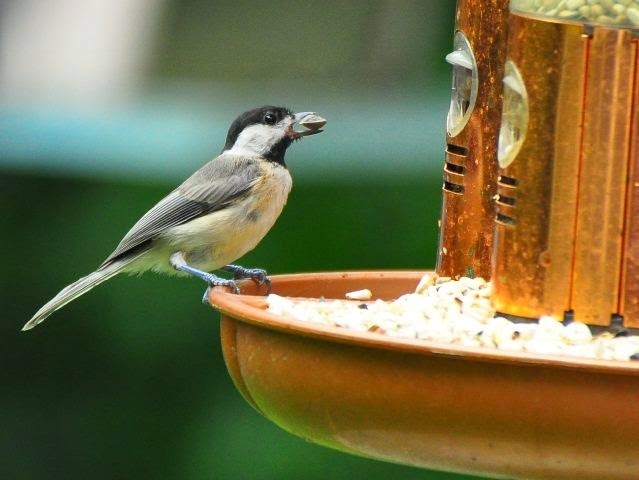 If you enjoy watching wildlife, an active nest box will provide great opportunities to observe nest building, feeding of young, fledging of young, and post-fledging activity. Lets start with the easiest to attract. 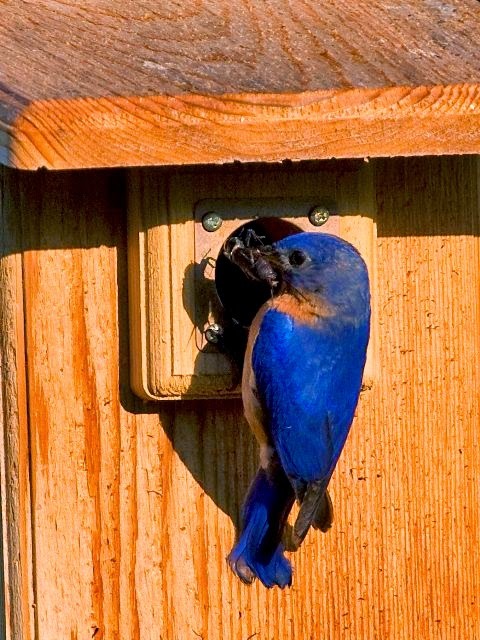 Eastern bluebirds often will check out a box within minutes after erecting it. Carolina chickadees vie with Eastern bluebirds for the choicest sites. Provide a custom bluebird box and a custom chickadee box to accommodate both. 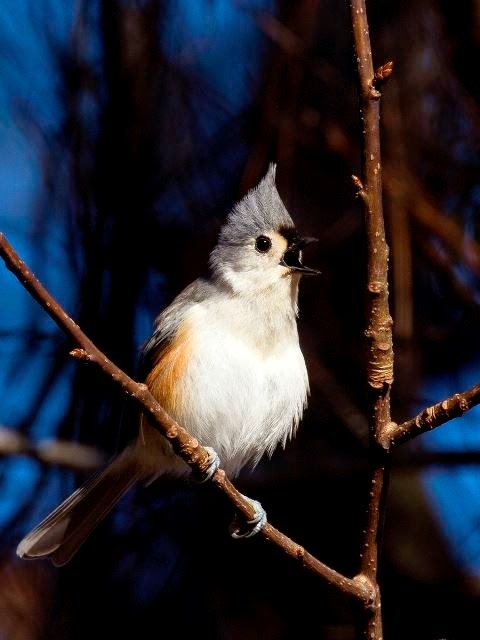 Tufted titmice, cousins to the Carolina chickadees, readily accept a bird box too. 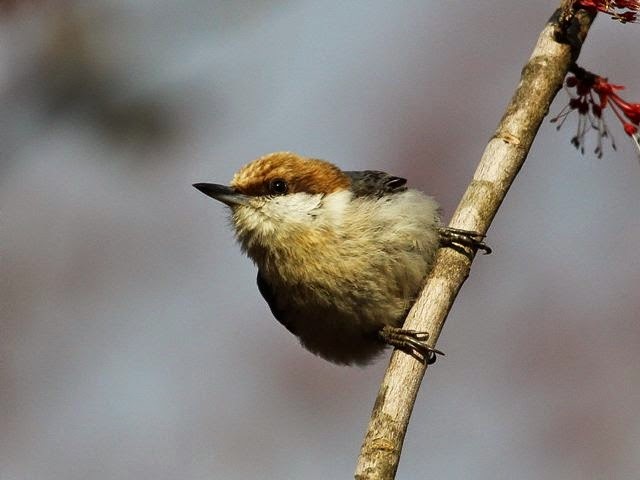 Brown-headed nuthatches need some help. This southeastern specialty doesn't compete well with other species for nest sites. Providing a custom built nuthatch box will help out this declining species. 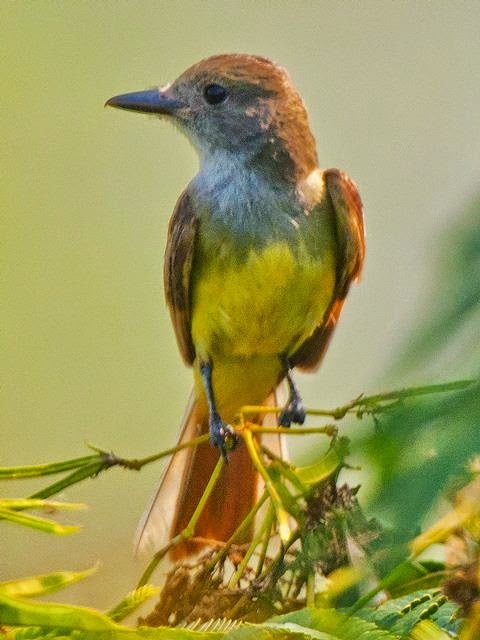 Great crested flycatchers are large birds and need a larger box. But they will readily use a custom box built to their specifications. they are present in the treetops in most neighborhoods. 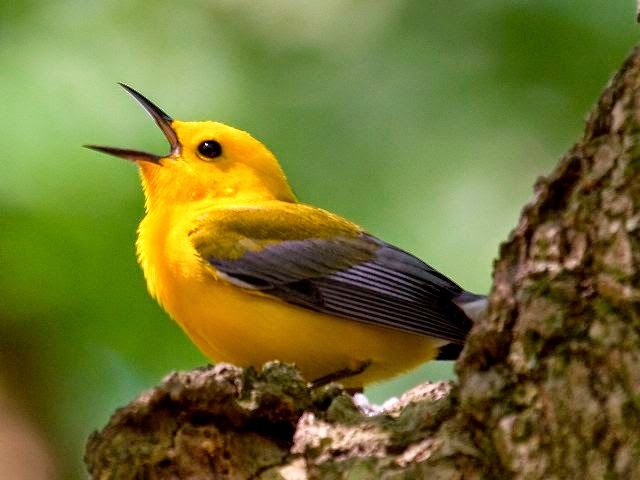 The prothonotary warbler uses low swamps as a habitat. they also are the only eastern warbler that utilizes bird boxes. Forget it if you aren't near some swampy lowlands, but if you back up to Four-Mile Creek Greenway, Lower McAlpine Greenway, or McMullen Creek Greenway you might get lucky. Songbirds are not the only bird group to use nest boxes. Eastern screech-owls readily take them but you will be lucky to get them. 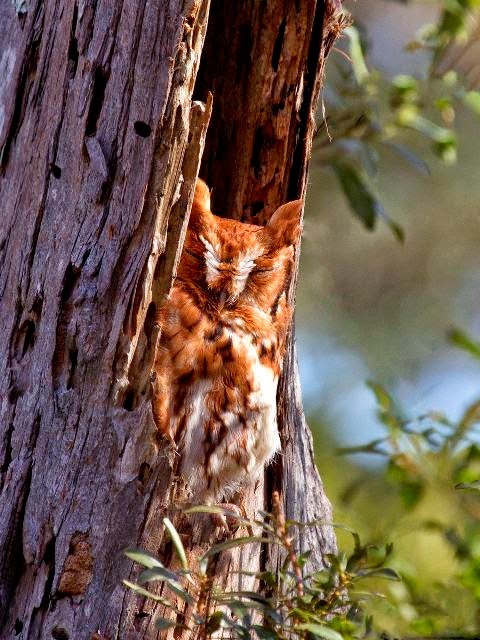 Woodlots made up of hardwoods might harbor a pair of screech-owls. Even large owls will take a box if it is large enough. 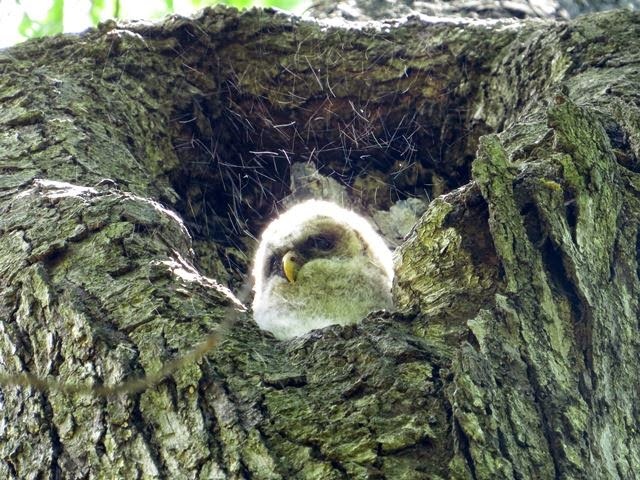 This barred owl chick was in a cavity in Latta Park in Charlotte. There is an owl box there that has been used most years, but last year the owls used a natural cavity.